Partnering with Crescent Racing, Yamaha will mount a serious factory WSB effort next year with the experienced former champion Sylvain Guintoli, and former British Superbike champ Alex Lowes. The last time Yamaha took its new R1 into WSB, it won the championship with Ben Spies aboard in 2009. We find it interesting that Yamaha, arguably, will have the highest profile roadracing endeavor among major manufacturers beginning next year. Now that Suzuki and Aprilia have MotoGP teams, one has to wonder whether Kawasaki will do the same in the near future, particularly now that it is doing so well at the WSB level. Kawasaki is launching a redesigned ZX-10R for 2016. 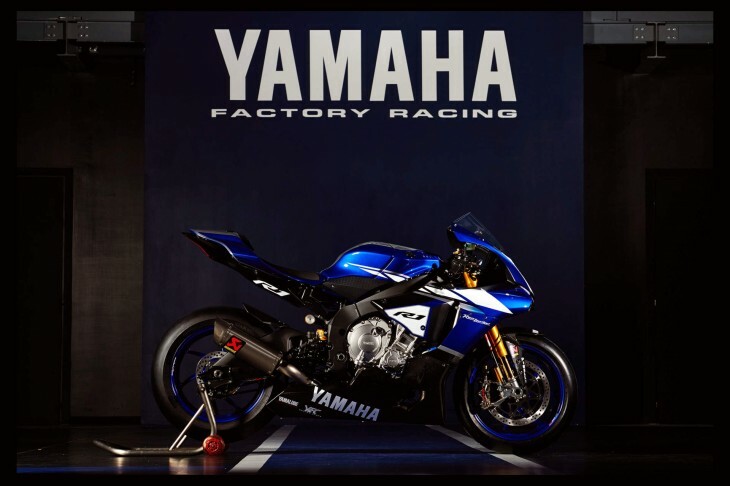 The all-new Yamaha YZF-R1 arrived as a game changer in 2015, re-writing the rulebook for the Supersport market as the next generation of racing machine. As the 2015 racing season draws to a close it can already claim numerous victories – including the inaugural Road America AMA Championship and the legendary Suzuka 8Hr Endurance race in the hands of MotoGP stars Pol Espargaro, Bradley Smith and five-time All Japan Superbike Champion Katsuyuki Nakasuga. In the UK the R1 is in contention for the British Superbike Championship title, while across Europe the story continues with both the Polish Superbike Championship and the French Superstock Championship secured. Yamaha also currently leads the Spanish FIM CEV Repsol International Championship and last weekend claimed second overall in the FIM Endurance World Championship in the hands of France’s GMT94 Yamaha team. Paintjob shmaintjob!! The bigger question is – how are they going to go about “fauxing” those bubble headlights? That’s the thing I hate most on the street bike (you’d have thought some aftermarket shopd would introduce some “hidden” light replacements by now). They gonna fit cardboard and paste light stickers on it or what? Seriously, that faux lighting rule in WSB needs to go. It’s amazing that all the comments seem to be paint related. I’m glad Yamaha is back. I think a championship that more closely resembles bikes that are actually sold to consumers is a great thing and having a major manufacturer mission is a shame. MotoGP is a very different thing. Unless you have an ‘alien’ on a very finely tuned machine, you have no chance of winning the championship. For a smaller manufacturer (compared to Honda and Yamaha) I’m not sure the impetus is there to join GP. After all, Kawi wasn’t exactly making huge strides in GP when they were participating. So, given limited resources, why would they split their effort amongst two championships, potentially pulling resources from a very successful WSB effort? We’ve certainly seen that success in GP doesn’t guarantee success in WSB or vice versa. I think Kawi should continue to drive hard at winning another WSB championship in the next few years and then see where the economic climate is. With a new 10R next year, who knows how log it will take for the riders to come to grips with it. It certainly has taken some time in the past. As for Yamaha, with the right riders they could really shake things up in WSB. And the combination of Guintoli and Lowes brings both experience and steady – champion ship winning approaches and youth to the team. I agree. The big news is that Yamaha is going back into WSB with a top machine. BMW tried and and found it not too easy. For those that want to reminisce about color it was red and white in the WSB with Scott Russel and Noriyuki Haga. I’m gonna show my support by buying my daughter a Yamaha…………saxaphone. It revs her heart! Bumblebee looked good with Kenny aboard cleaning house in Motogp. Looks too simplistic and dated for me now. But – let every man bee fully convinced in his own mind. The “bumblebee” paint job looks better. Now how can anyone looking at that say the bumblebee paint job looks better? It will be interesting to see Yamaha put some real effort into WSB. +1 that blue is lovely. what if maybe Kawasaki doesn’t need to return to gp? I mean, they are going to spend what? 7, 8 figure numbers to end up behind Honda and Yamaha? I see the H2 and R as better “promotional” products. Ah, you guys have your heads buried in the sand, the Bumble Bee’s the one! Finally, Yamaha is back in WSB. I’m going to have to order the WSB package along with the MOTO GP package. The bumblebee paint job looks better on a ’79 OW40.